This page explains the different query output options and how to use them. Once you have finished running your query, you will arrive at the Query Processing Options page and see the options below. If you are running a query involving EV/VBM voters, the process will be slightly different. For EV/VBM queries, see Vote-by-Mail Info. The export option allows you to download the data in text format. Select "show options." The following options will appear. Select the information that you would like exported, and select "run report" in the top right corner. 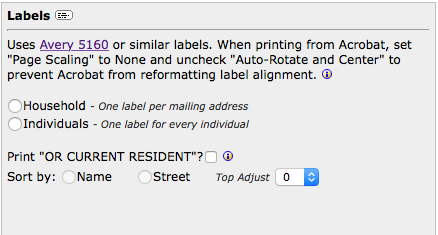 This option allows you to print mailing labels for the individuals or household in your query. They will print to Avery 5160 3 column 10 row sheets. When printing, be mindful of your printer settings. If your labels still print too high after setting the proper print options (turning off page-scaling and auto-rotate and center) you can move the top line down by a number of points (1 point = 1/72 inch). When you have selected the applicable options, click "run report" in the top right corner. Post cards prints the address of the households or individuals in your query to letter size card stock that you can cut to post cards. If you want to include a return address on the post cards, that can be set in "Campaign Setup" on the old menu, or "Settings" on the new menu. Action Lists allow you to save a target selection as a Walk Project and stores all progress as you create packets in Google Maps and walk the houses. Walk Projects power the mobile walk app (the "Google Maps Integration" add-on must be purchased for this to work). Once your list is created and saved, you can plot it to Google Maps at any time to create packets. To see details of this process, watch the demonstration video on our webElect videos page. The packets can be then be printed or accessed in the Walk App. 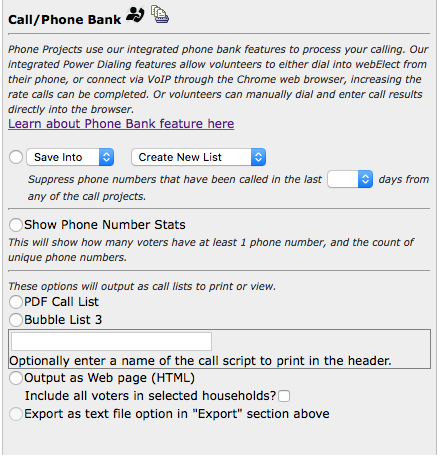 Saving the query results to a list will create a new Phone Bank project. If you already have calls being made in other projects, use the suppress option to prevent numbers from being added that have already been called recently in other project. 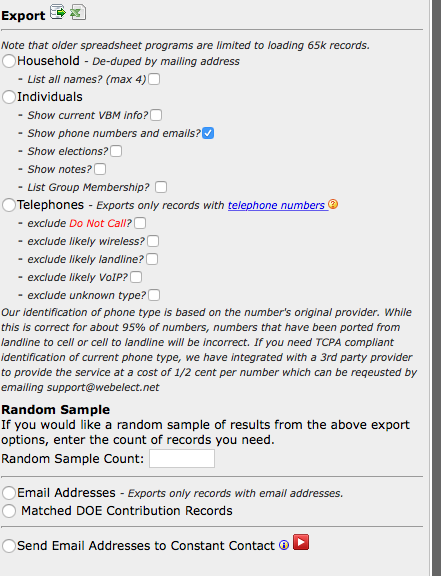 Selecting "Show Phone Number Stats" will show how many voters have at least 1 phone number, and the count of unique phone numbers. There is also an option to output the query results as lists for printing or viewing. Use caution when using this method to be sure that you do not duplicate voters on multiple lists or with a phone bank project. The very last option "Export as text file in Export section above" is not a clickable selection, rather a redirection to the Export option. Adding/kicking out of will add or remove the targeted individuals from the selected group. To create a new group, select "Add to" and "Create new group," on the next screen you will be able to name the group. 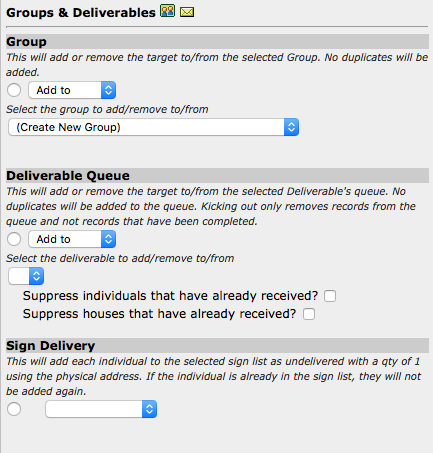 This will add or remove the target to/from the selected Deliverable's queue. Duplicates will not be added. Kicking out only removes records from the queue and not records that have been completed. This will add each targeted individuals to the selected sign list as undelivered using the physical address. Duplicates will not be added. 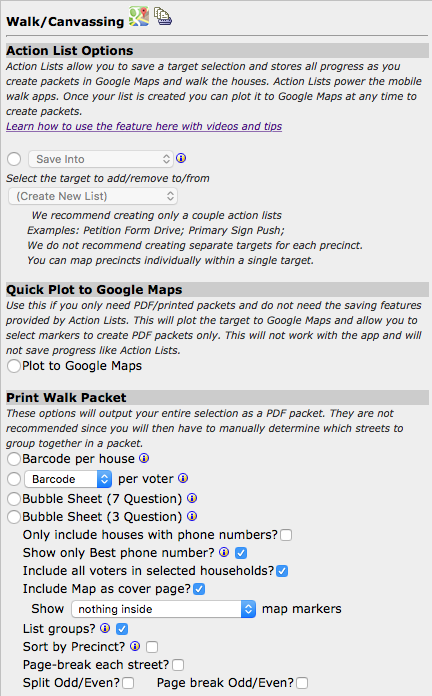 This option will print pre-filled petitions and vote-by-mail ballot request forms. Before outputting petitions, you must enter in the petition information. This can be done in "Campaign set-up" on the old menu, or "Settings" on the new menu. 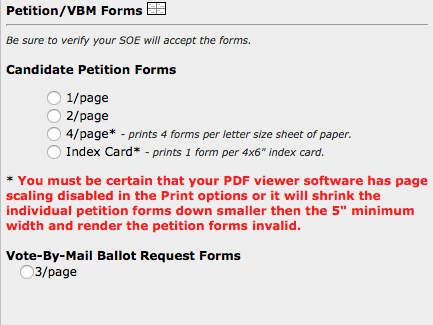 **Be certain that your PDF viewer software has page scaling disabled in the print options or it will shrink the individual petition forms down smaller than the 5" minimum width and render the petition forms invalid. 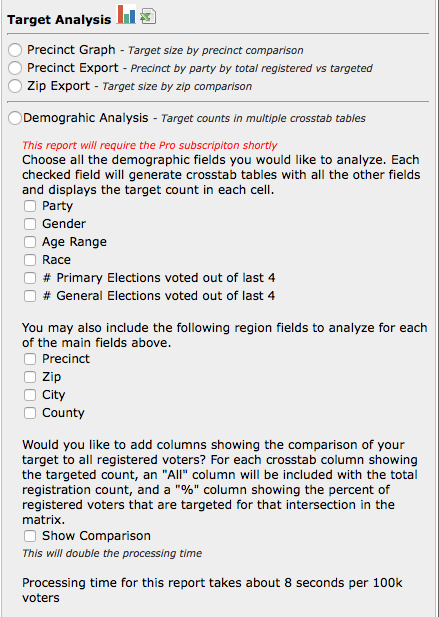 Use this option to analyze the quantity of Republicans, Democrats, and Others in the selected target by precinct, party, or zip. You can also run demographic analysis on the target. This is currently accessible to Classic users, but in the future will become available only with the Pro Package. Choose the month of birthdays that you would like to mail, then export the list, print labels, or print post cards. This option is only available to members who have the Pro Package. 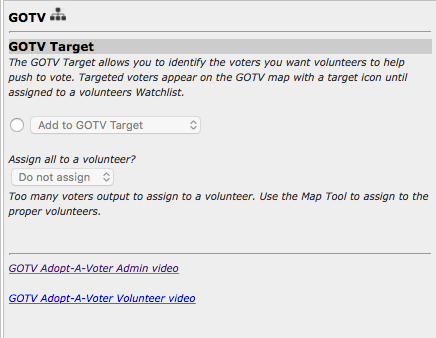 Add voters to your "Get out the Vote" target for assigning to volunteers. For more information, see our GOTV Admin Video. "View list" will allow you to view a list of the individuals in your target.